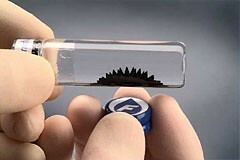 Ferrofluid is a material originally developed by NASA. It is now being used for a range of practical devices, including dampers for controlling and stabilizing large buildings that move around in the wind. But it also has lovely visual qualities when magnetized, which some people are using for artistic purposes. 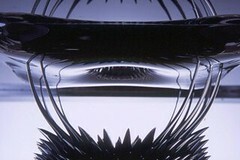 Sachiko has taken the idea of "liquid architecture" literally with these sculptures made from Ferrofluid, which changes its state by the introduction of electro-magnetic waves. Australian digital artist Pierre Proske (www.digitalstar.net) is working with researchers at the Future Applications Lab of the Viktoria Institute in Sweden to develop intelligent fridge magnets ( www.viktoria.se/fal/interns/summer05/poetry). Each fridge magnet consists of a 16-character liquid crystal display, which may one day be able to fix bad grammar and change the words to something they think is more appropriate. Mr Proske says "The idea is that each magnet is aware of the other magnets on the fridge and they transmit information between each other". He explains this is a "whimsical and accessible" way to contribute to the study of developing intelligent robots. Mr Proske and colleagues have so far half developed a prototype intelligent fridge poetry magnet system and are hoping to get more ideas at the International Conference on Intelligent User Interfaces ( www.iuiconf.org/06program.html) in Sydney during January 2005.